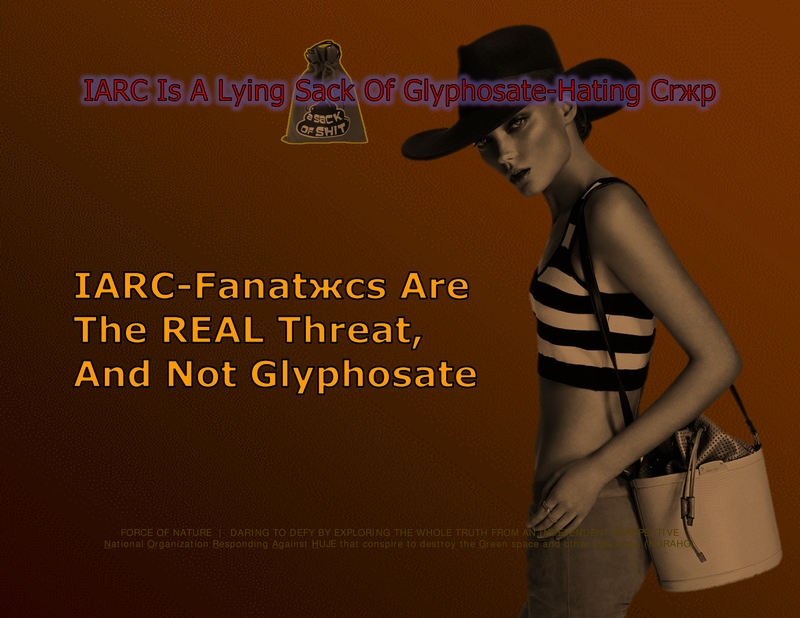 International Agency for Research on Cancer ( IARC ) is an anti-glyphosate & environmental-terrжrist organization. 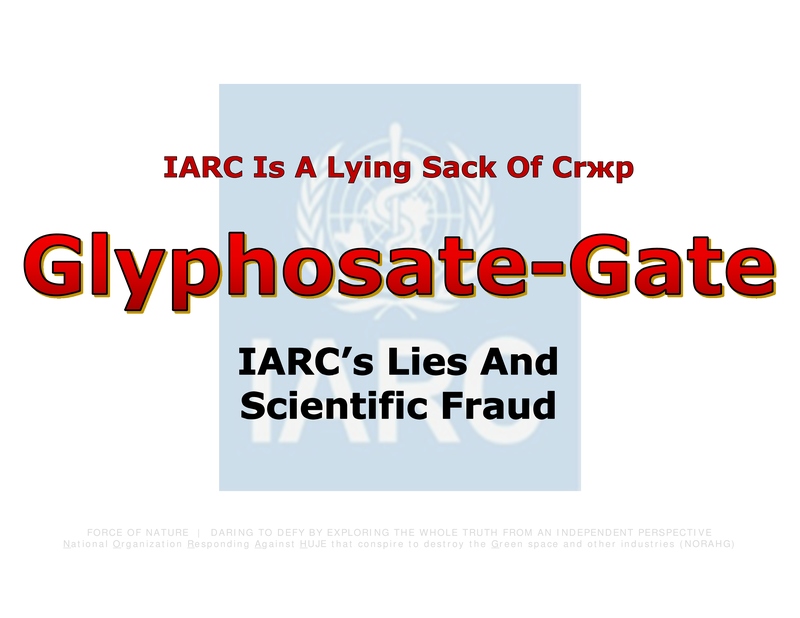 IARC, the ONLY major science body to insist that glyphosate causes cancer [ ?!?! ], has been caught DOCTORING DOCUMENTS and MANIPULATING EVIDENCE to support its conclusion. Occasionally, BAD SCIENCE is promoted by lunatжcs who receive PAY-OFFS and practice SCIENTIFIC FRAUD. THE MOTIVATION SEEMS TO BE FINANCIAL. A key IARC lunatжc-advisor who LOBBIED against Glyphosate has, in essence, received a PAY-OFF of 160,000 DOLLARS. He was BRIBED by lawyers who stand to profit from potential lawsuits involving Glyphosate. This is a truly GIGANTIC SCANDAL that has ( predictably ) received scant press coverage. IARC has severely and perhaps IRREPARABLY DAMAGED the reputation of its parent, the World Health Organization ( WHO ). 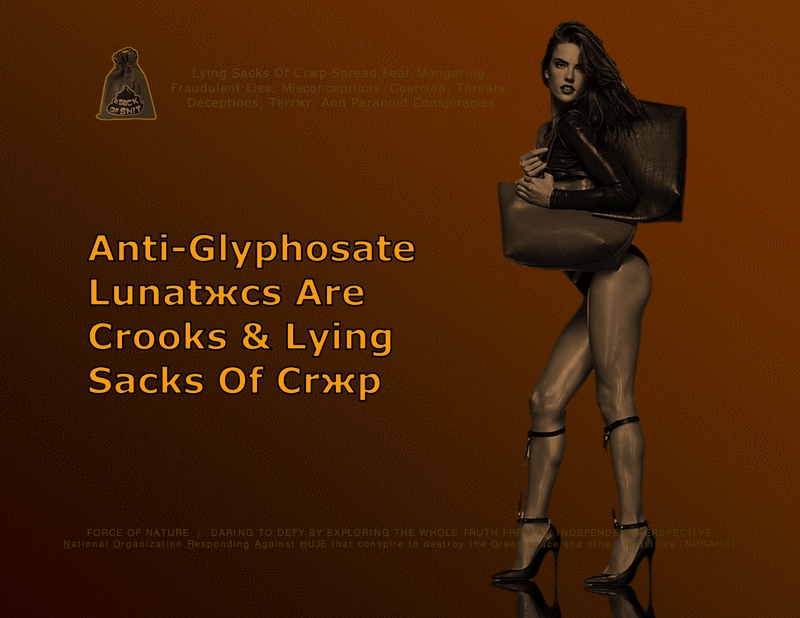 ANTI-GLYPHOSATE LUNATЖCS ARE CROOKS AND LYING SACKS OF CRЖP ! 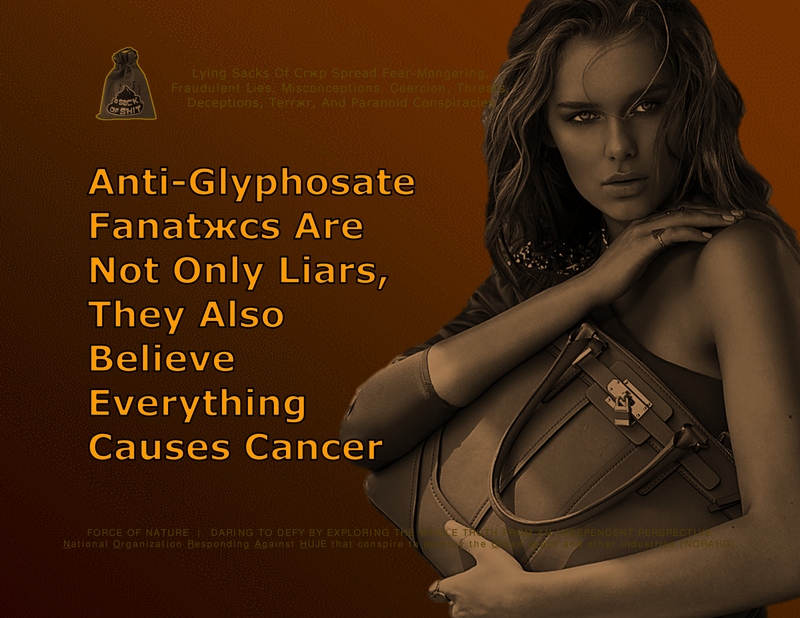 NO science and regulatory body in the world classifies Glyphosate as a human carcinogen. 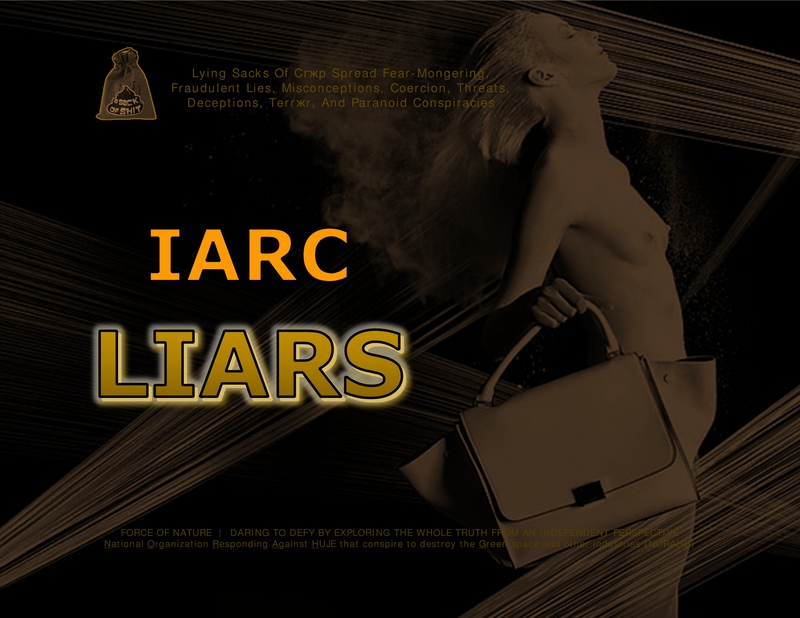 WHY IS IARC A LYING SACK OF CRЖP ?!?! 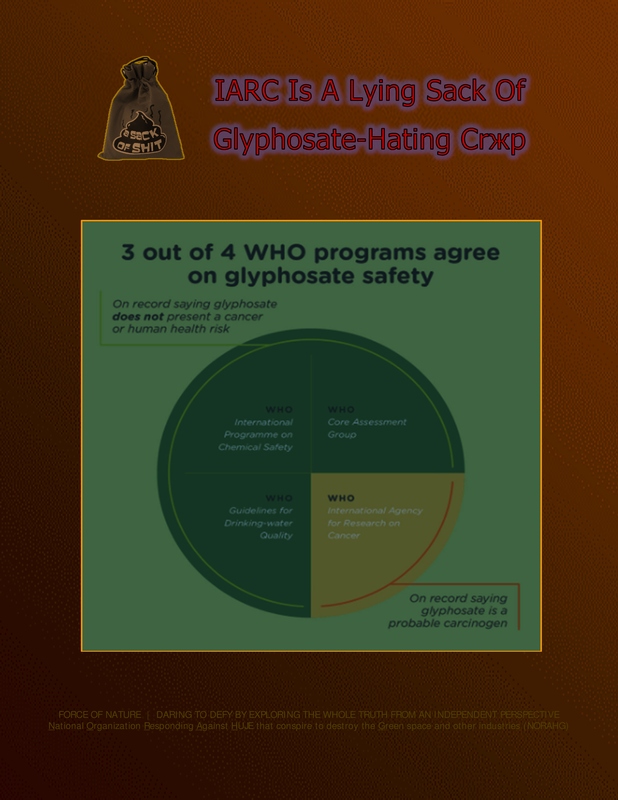 The International Agency for Research on Cancer ( IARC ) operates under the umbrella of the World Health Organization ( WHO ) of the United Nations ( UN ) ― both the WHO and the UN DO NOT consider Glyphosate a health risk. WHY IS THE IARC’S HAZARD REPORT DEBUNKED ?!?! IARC focuses on HAZARD assessments as opposed to RISK assessments that are dependent on exposure, meaning that it tries to find out if something COULD cause cancer. IARC DOES NOT assess whether an agent is likely to cause cancer. IARC has classified hundreds of agents and situations as cancer-causing that are otherwise classified by regulatory agencies around the world as SAFE. The risk/hazard distinction CONFUSES the public, and even some regulatory agencies, and is exploited by anti-pesticide & environmental-terrжrist organizations that often conspire to portray relatively safe products like glyphosate as dangerous. 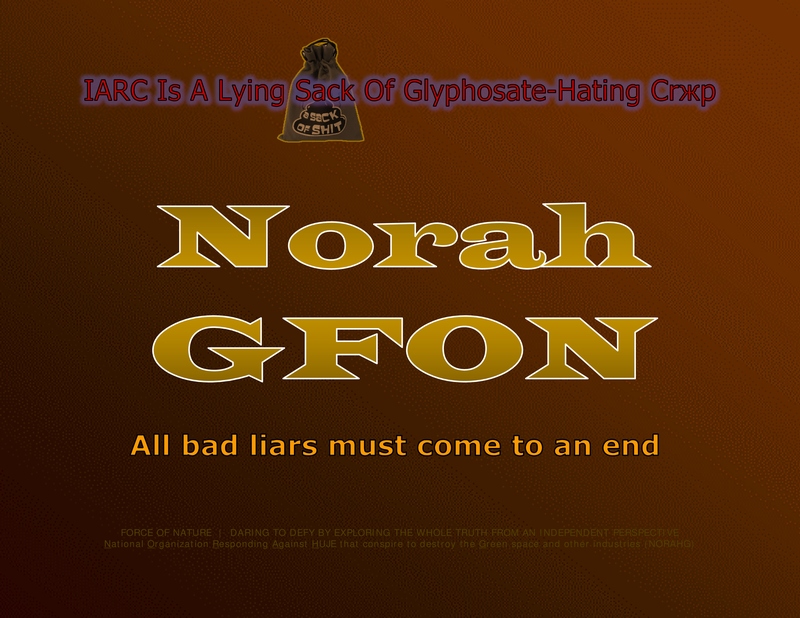 IARC IS A LYING SACK OF CRЖP ! The first director of IARC ( the International Agency for Research on Cancer ), Dr John Higginson, was also a scientific advisor to the American Council on Science and Health. Those were the glory days of IARC, which was founded for the purpose of identifying human carcinogens for further study and to guide health policy. Unfortunately, much has changed since 1965. Fifty-two years after its inception, IARC has become a FRINGE GROUP, seemingly MORE INTERESTED IN SCARING PEOPLE than identifying actual health threats. Any organization that declares bacon to be as dangerous as plutonium has entirely LOST ITS WAY. Things started to unravel for IARC over a popular herbicide called Glyphosate, which, according to its hazard report, is a « probable human carcinogen ». Every major science and regulatory body DISAGREES with the IARC’s hazard report, including the US EPA and the European Food Safety Authority ( EFSA ). Even the World Health Organization [ WHO ], which is the parent of IARC, believes that Glyphosate DOES NOT CAUSE CANCER. What is going on ?!?! Thanks largely to the investigative work of Dr David Zaruk on Science 2.0, The Times reports that Christopher Portier, a key IARC lunatжc-advisor who LOBBIED against Glyphosate to have listed as a carcinogen, ACCEPTED 160,000 DOLLARS from trial lawyers representing cancer patients who stood to profit handsomely by SUING Glyphosate manufacturers. PORTIER’S FAILURE TO DISCLOSE SUCH OBVIOUS CONFLICTS-OF-INTEREST HAS EXPLODED INTO A TEXTBOOK CASE OF SCIENTIFIC FRAUD. CHRISTOPHER PORTIER IS A LYING & FRAUDULENT SACK OF CRЖP ! Can Be Bought-Off By Trial Lawyers ?!?! Reuters reports that evidence that Glyphosate was harmless was intentionally EDITED-OUT of an IARC monograph. The monograph also DISTORTED other studies it cited ― for instance, by concluding that the research found a link between Glyphosate and cancer when the OPPOSITE WAS TRUE. Furthermore, Reuters writes that « the agency [ IARC ] won’t say who made the changes or why ». Sixteen scientists contacted by Reuters REFUSED to answer any questions about the edits. That’s not how science operates ― that’s how Fight Club operates. Truly, it is difficult to overstate the SERIOUSNESS of what IARC and Mr Portier have done. As Dr Zaruk writes for his Risk-Monger site, such behavior UNDERMINES not only the World Health Organization, but the scientific enterprise itself. How can people trust health advice from IARC when its lunatжc-advisors, like Portier, who dispense the advice, can be BOUGHT-OFF BY TRIAL LAWYERS ?!?! At American Council on Science and Health ( ACSH ), we believe that GOOD SCIENCE IS GOOD REGARDLESS OF WHO PAYS FOR IT ― be it academia, the government, non-profits, or industry. Scientific research must be JUDGED ON ITS MERITS ALONE. That’s why people who cry, « corporate shill ! » are little more than conspiracy theorists. However, BAD SCIENCE is another issue entirely. The vast majority of the time, BAD SCIENCE is promulgated by researchers or journalists who are NOT good at their jobs, or DO NOT know any better. Occasionally, BAD SCIENCE IS PROMOTED BY PEOPLE WHO ARE BEING BOUGHT OFF. This [ the IARC’s hazard report ] is one of those times. IARC has severely and perhaps IRREPARABLY DAMAGED the reputation of the World Health Organization [ WHO ]. Besides, given the sheer number of regulatory bureaucrats who already exist world-wide in the US, Europe, and elsewhere, IARC’s role is REDUNDANT, and ONLY SERVES TO ADD CONFUSION RATHER THAN CLARITY. It ought to be DEFUNDED AND DISBANDED, and we are recommending the US government do just that. In March 2015, the International Agency for Research on Cancer, or IARC, issued a BOGUS HAZARD REPORT labeling the weed killer Glyphosate a « probable carcinogen ». IARC’s BOGUS HAZARD REPORT caused consternation in the scientific and agricultural communities. Glyphosate, which is manufactured by Monsanto and is the active ingredient in the company’s popular Roundup, is one of the most widely-used herbicides world-wide. It is cheap, effective, and has low toxicity. IARC’s BOGUS HAZARD REPORT goes against the world-wide assessment of every other agency that has evaluated the compound, including the US Environmental Protection Agency [ US EPA ], the European Food Safety Authority, and the World Health Organization, of which IARC is a part. IARC, which is based in Lyon, France, makes its assessments by convening a panel of experts [ in a working group ] to consider all the available evidence from human, animal, and mechanistic studies regarding a potential cancer threat. IARC then classifies a given substance as carcinogenic ( Group 1 ), probably carcinogenic ( Group 2A ), possibly carcinogenic ( Group 2B ), or NOT classifiable as to carcinogenicity. For its Glyphosate Working Group, IARC formed a Working Group of 16 experts who reviewed the evidence for nearly a year before issuing its report in March 2015. The IARC’s Glyphosate Working Group was sub-divided into subgroups to assess the human evidence, the animal studies, and the mechanistic/laboratory studies. At the end of the review process, the IARC’s Glyphosate Working Group designated Glyphosate as a « probable carcinogen » based on the animal evidence, which was judged to be « sufficient ». We will come back to this point later. What is NOT widely known is that the IARC’s classification of a substance DOES NOT take into account the degree of exposure to that substance in the general population. Rather, in IARC’s terminology, it evaluates « hazard » ― the possibility that a substance could cause cancer under some possible condition ― as opposed to « risk », which refers to the likelihood that actual exposure in the real world might cause cancer. Needless to say, when headlines trumpet the IARC’s hazard report, the public and the media assume that classification of an agent as « probably carcinogenic » must have some direct relevance to human health, even when actual human exposures are at levels too low to cause adverse health effects. Over the past few years, when scientists have questioned the IARC’s process and some of its recent classifications, rather than addressing specific criticisms, IARC officials have argued that their methods are sound and NOT in need of improvement, and have implied that their critics have CONFLICTS-OF-INTEREST. In the past year, however, as IARC’s hazard report has been subjected to scrutiny by scientists and investigative journalists, a number of INCREASINGLY DISTURBING QUESTIONS have come to light. Three major, independent pieces of the « BACK-STORY » on IARC’s BOGUS HAZARD REPORT are presented below. In August 2016, Mr Robert Tarone published a commentary entitled « On The International Agency For Research On Cancer Classification Of Glyphosate As A Probable Human Carcinogen » in the European Journal of Cancer Prevention. Mr Tarone, who is a statistician who spent most of his career at the National Cancer Institute, RE-EXAMINED THE ANIMAL STUDIES cited by IARC. In such studies, typically a strain of rodents is divided into one or more « treatment » groups and a control group ― and the former is exposed to a test substance at increasing dose levels ― in this case, Glyphosate ― while the control group is unexposed to the test substance. As animals die they are examined, and at the end of the study the remaining animals are sacrificed and their organs are examined for benign and malignant changes. What is crucial is to determine whether the treatment group shows robust evidence of a greater « tumor yield » compared to controls. In relatively small animal experiments there will likely be ups-and-down, but one is looking for a consistent excess of tumors in the treated group. Most persuasive would be evidence of a dose-response relationship ― that is, the more of the substance that the test animals are given, the greater the tumor yield. Furthermore, one might expect to see consistency in male and female animals, if the substance is carcinogenic. What Mr Tarone found is that the IARC’s Glyphosate Working Group highlighted certain positive results from the rodent studies they relied upon in the deliberations, and, glaringly, IGNORED CONTRADICTORY NEGATIVE RESULTS from the same studies. Mr Tarone also found that an INAPPROPRIATE STATISTICAL TEST was used, making the data look more impressive than they actually were. When all relevant data from the rodent carcinogenicity studies of Glyphosate relied on by the Working Group are evaluated together, it is clear that the conclusion that there is sufficient evidence that Glyphosate is an animal carcinogen is NOT SUPPORTED EMPIRICALLY. In reviewing the human ( i.e. 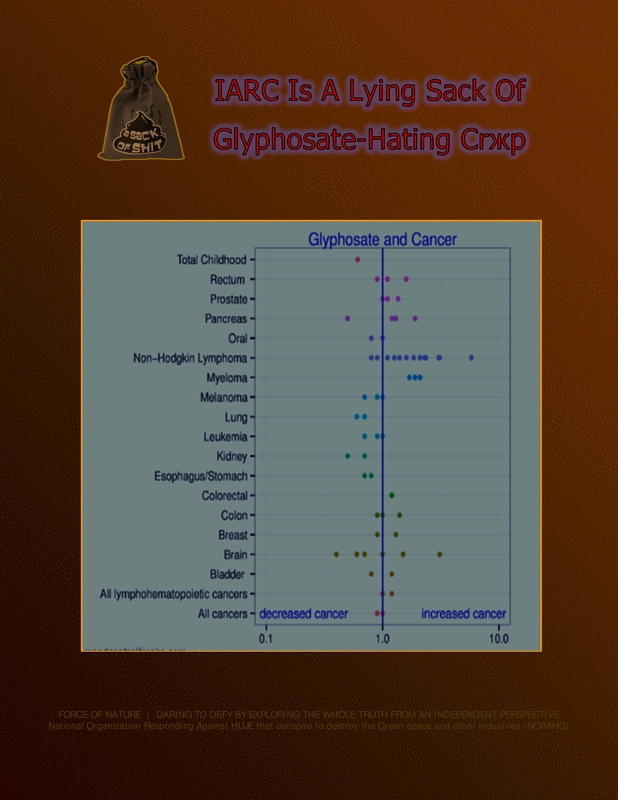 epidemiologic ) studies, Mr Tarone found that IARC’s case for Glyphosate’s association with non-Hodgkin’s lymphoma also resulted from FAVORING CERTAIN STUDY RESULTS, rather than considering the totality of the evidence. In the past week, two new insights into the IARC’s BOGUS HAZARD REPORT have emerged, coalescing into a FULL-BLOWN SCANDAL. Mr Davis Zaruk, a blogger who uses the pen-name Risk-Monger, examined the TRANSCRIPTS, posted on the Internet, of a deposition related to cases against Monsanto involving the lunatжc-scientist-activist Christopher Portier. 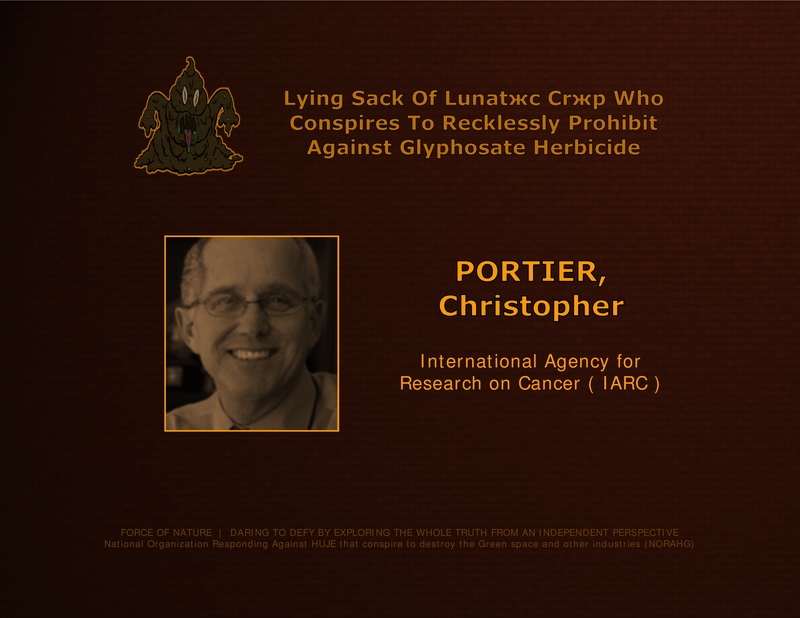 Portier, an American statistician who worked for the federal government for over thirty years, was the special advisor to the IARC’s Glyphosate Working Group that issued its BOGUS HAZARD REPORT declaring Glyphosate to be « probably carcinogenic ». The TRANSCRIPTS show that during the same week in March 2015 in which IARC published its Glyphosate opinion, lunatжc Portier SIGNED A LUCRATIVE CONTRACT to act as a litigation consultant for two law firms that were preparing to sue Monsanto on behalf of Glyphosate cancer victims. His contract contained a confidentiality clause barring lunatжc Portier from disclosing his employment to other parties. Lunatжc Portier’s FINANCIAL CONFLICTS-OF-INTEREST has been confirmed by the UK newspaper The Times. It turns out that it was lunatжc Portier himself, who as chair of an IARC committee in 2014, had PROPOSED that the IARC UNDERTAKE A REVIEW of Glyphosate in the first place. 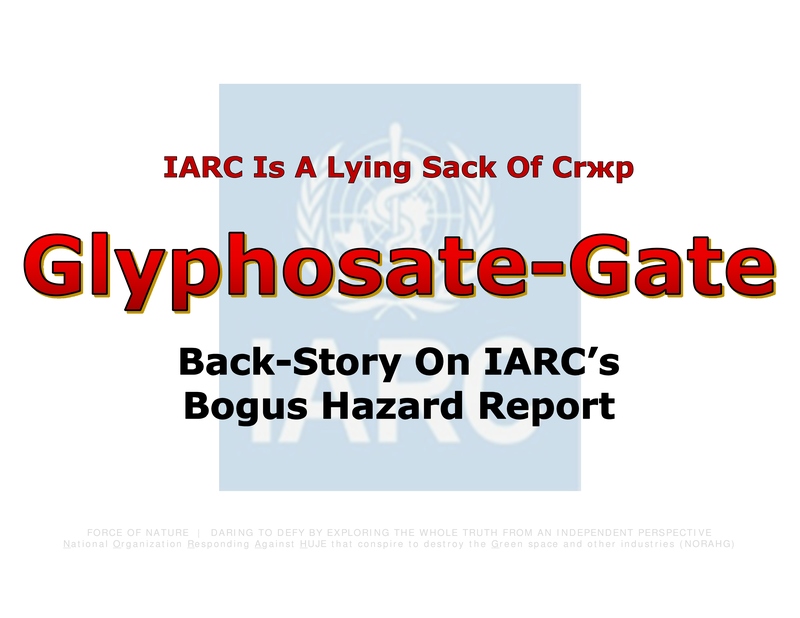 Lunatжc Portier then went on to PLAY A KEY ROLE in the deliberations resulting in the IARC’s BOGUS HAZARD REPORT that Glyphosate is « probably carcinogenic ». In view of the new revelations, it appears that, rather than being the objective scientist he has portrayed himself to be, lunatжc Portier may have had a PRECONCEIVED PLAN to use the IARC ruling, which he played a major role in shaping, to CASH IN ON THE ENSUING LITIGATION CAMPAIGN. At the same time, lunatжc Portier and IARC generally have portrayed any scientist who questioned the evidence of Glyphosate’s carcinogenicity as being MOTIVATED BY PRO-INDUSTRY BIAS. This has proved an effective tactic for SUPPRESSING SUBSTANTIVE ARGUMENTS based on the scientific evidence. CHRISTOPHER PORTIER IS A LYING SACK OF CRЖP ! On the heels of Risk-Monger’s exposé, on October 21st, 2017, Ms Kate Kelland, a journalist for Reuters, who has been investigating IARC’s BOGUS HAZARD REPORT, published findings indicating that the report underwent SIGNIFICANT EDITING to REMOVE NULL RESULTS and to STRENGTHEN POSITIVE CONCLUSIONS. Ms Kelland obtained a draft of the key chapter of the IARC’s BOGUS HAZARD REPORT devoted to animal studies, which became available as part of the lawsuits against Monsanto, and she compared the draft with the final, published report. … a NEGATIVE CONCLUSION about Glyphosate leading to tumors was either DELETED or REPLACED WITH A NEUTRAL OR POSITIVE ONE. Ms Kelland’s findings indicate that the ORIGINAL DRAFT FOUND LITTLE ANIMAL EVIDENCE THAT Glyphosate WAS A CARCINOGEN. Ms Kelland’s textual analysis provides CONFIRMATION of Tarone’s INDEPENDENT RE-ANALYSIS of the original studies. Furthermore, lunatжc Portier admits in his deposition that the interim report produced by the animal sub-group during the IARC’s Glyphosate Working Group meeting also concluded that there was « limited evidence of animal carcinogenicity ». Lunatжc Portier PROCLAIMS IGNORANCE of when or how the conclusion was upgraded to « sufficient evidence of animal carcinogenicity » during the deliberations of the entire IARC Glyphosate Working Group. It is crucial to repeat that the classification of Glyphosate as « probably carcinogenic to humans » relied entirely upon the conclusion that there was sufficient evidence of animal carcinogenicity ( because the epidemiologic evidence was NOT strong ). ALL OF THIS POINTS TO A TRUSTED AGENCY [ IARC ] REDACTING [ i.e. EDITING ] THE EVIDENCE TO SUIT ITS PRE-DETERMINED AND PREFERRED STORY-LINE. In addition to PROVIDING THE BASIS FOR LITIGATION by U.S. law firms, IARC’s BOGUS HAZARD REPORT against Glyphosate PROVIDED POWERFUL AMMUNITION to environmental activists, anti-GMO groups, NGOs, and organic foods industry lobbyists on both sides of the Atlantic in their campaign to PROHIBIT Glyphosate. For the past two years, the European Union has been TRYING TO RE-AUTHORIZE the herbicide, but has been opposed by politicians in Member States who have been swayed by the anti-Glyphosate crusade [ i.e. conspiracy ]. A decision to PROHIBIT or to PHASE-OUT the use of Glyphosate will HURT both farmers and consumers by decreasing crop yields, increasing the costs of produce, and requiring substitution of herbicides about which less is known and which may pose a greater health risk. GLYPHOSATE HAS BEEN VINDICATED BY THE EUROPEAN UNION ! The majority of EU nations DO NOT WANT anti-glyphosate prohibition. On November 27th, 2017, the European Union ( EU ) voted to EXTEND its RE-APPROVAL of glyphosate for a period of 5 YEARS. Glyphosate was NOT approved for the typical 10 or 15-years because the EU review process was driven more by politics than science. Nonetheless, the European Union has VINDICATED glyphosate. With the EU RE-APPROVAL, the International Agency for Research on Cancer ( IARC ) has been DISCREDITED, again, and forever. The IARC’s BOGUS HAZARD REPORT has been disputed by EVERY science-based national regulatory agency in the world, including two in Europe ― the European Food Safety Authority and the European Chemicals Agency. The latest major study, published in November 2017 by National Cancer Institute researchers concluded that … glyphosate was NOT statistically significantly associated with cancer. Nonetheless, the EU may still be able to prohibit glyphosate’s use after the 5-year re-approval period. Anti-glyphosate terrжrism will NEVER end ! But, it is inescapable that glyphosate DOES NOT cause cancer ! Glyphosate has been VINDICATED around the world, in the following jurisdictions ― • Australia • Canada • European Union • New Zealand • Nova Scotia • Switzerland • United States ( America ). The REVELATIONS about IARC’s BOGUS HAZARD REPORT carry crucial lessons regarding relations among scientific evidence, policy, and public opinion. Decisions about the safety of chemical residues in the environment are challenging and require critical evaluation of the available evidence by experts in the relevant disciplines. These can only be achieved through a hashing out of the relevant evidence in a forum in which qualified scientists with NO PROFESSIONAL OR POLITICAL STAKE in the question at hand have an important role in order to keep the proceedings honest. In the highly-charged and polarized climate surrounding questions involving public health and the environment, it is only too easy for advocates to gain support for their cause by appealing to public concern. Often this concern relates to trace levels of a chemical in our food, water, or environment. But the two sides in the debate are NOT equal. Evidence, NO matter how weak or questionable, of a positive association is readily accepted as pointing to a serious threat. In contrast, even when there is superior evidence that calls into question the existence of threat, this simply DOES NOT have the same power to persuade concerned citizens. A closely related point is that the prevailing view of CONFLICTS-OF-INTEREST is one-sided and naïve and represents a major obstacle to achieving rationality in the public discussion of hotly contested questions like Glyphosate. To be sure, industry has its clear interests, and, of course, these should be taken into account. In fact, the awareness of industry interests is, by now, built into our thinking. Things are quite different when it comes to seeing the interests at work on the other side. Given that deliberations on these matters involve human beings, we need to take it as axiomatic that all parties may be influenced by financial considerations ― or equally importantly — by ideological and professional agendas. We delude ourselves if we think that environmental activists and allied scientists ( including academic and government researchers ) engaged in these questions are free of their own interests. The recent REVELATIONS about IARC’s BOGUS HAZARD REPORT throw these issues into stark relief. Scientists and agencies need to be transparent. It’s NOT acceptable for an agency [ i.e. IARC ] to argue that « we are impartial authorities, trust us ». Rather, we should follow the rule, « trust but verify » ― or rather, « distrust but verify ». THESE REVELATIONS ABOUT IARC’S BOGUS HAZARD REPORT MAKE IT CLEAR THAT, WHERE HIGH-STAKES ISSUES INVOLVE POWERFUL BELIEFS, SUBSTANTIAL FINANCIAL REWARDS, AND OPPORTUNITIES FOR ADVANCEMENT, NEITHER INDIVIDUALS NOR AUTHORITATIVE AGENCIES CAN BE ASSUMED TO BE FREE OF CONFLICTS-OF-INTEREST. Dr Kabat is among several leading experts who have recognized expertise, training and background in matters concerning pest control products. Dr Kabat is among greatly respected and highly rated experts who promote environmental realism and pesticide truths. Dr Kabat is a Doctorate-Level Expert and a Leading Scientific Expert on Cancer and Pest Control Products. He is also a Senior Cancer Epidemiologist at Albert Einstein College of Medicine at the Department of Epidemiology and Population Health, located in the Bronx in New York City. He also holds the position of Scientific Advisor at American Council on Science and Health ( ACSH ). Dr Kabat contributes a column to Forbes magazine, described as being about The Science and Politics of Health Risks. He is the author of the books entitled Hyping Health Risks – Environmental Hazards In Daily Life and the Science of Epidemiology and Getting Risk Right : Understanding the Science of Elusive Health Risks. Dr Kabat is also one of the most prominent and knowledgeable spokesmen on the subject of pest control products. He has also effectively spoken out against the lies and mis-information that are spread by International Agency for Research on Cancer. Dr Kabat speaks the truth ― and deserves congratulation. The International Agency for Research on Cancer ( IARC ) is a semi-autonomous inter-governmental agency under the umbrella of the World Health Organization ( WHO ) of the United Nations ( UN ) funded by member countries, including the United States. It brings together groups of scientists to review studies to identify chemicals, physical and biological agents, and life-style factors that could POSSIBLY cause cancer in humans. IARC focuses on « hazard assessments » as opposed to « risk assessments », meaning that it tries to find out if something COULD cause cancer. It DOES NOT assess whether an agent is LIKELY to cause cancer ( that’s a « risk » assessment, and risk is dependent on exposure ). As a result, IARC has classified hundreds of agents and situations as cancer-causing that are [ otherwise ] classified by regulatory agencies around the world as safe. Of the nearly 1,000 factors that IARC has evaluated, ONLY ONE has ever been deemed non-carcinogenic. The IARC’s list of « known » ( group 1 ), « probable » ( group 2A ), and « possible » ( group 2B ) carcinogens includes ― sunshine, mobile phones, alcoholic beverages, wood dust, coffee, outdoor pollution, working as a hairdresser, wood smoke, night shifts, hot yerba mate tea, red meat ― and the herbicide Glyphosate. Only the Glyphosate designation has led to world-wide protests by advocacy groups and concern by government agencies in some countries, particularly in Europe. IARC became embroiled in a SCANDAL in June 2017. Reuters reported that IARC WITH-HELD INFORMATION SHOWING NO LINK BETWEEN GLYPHOSATE AND CANCER. 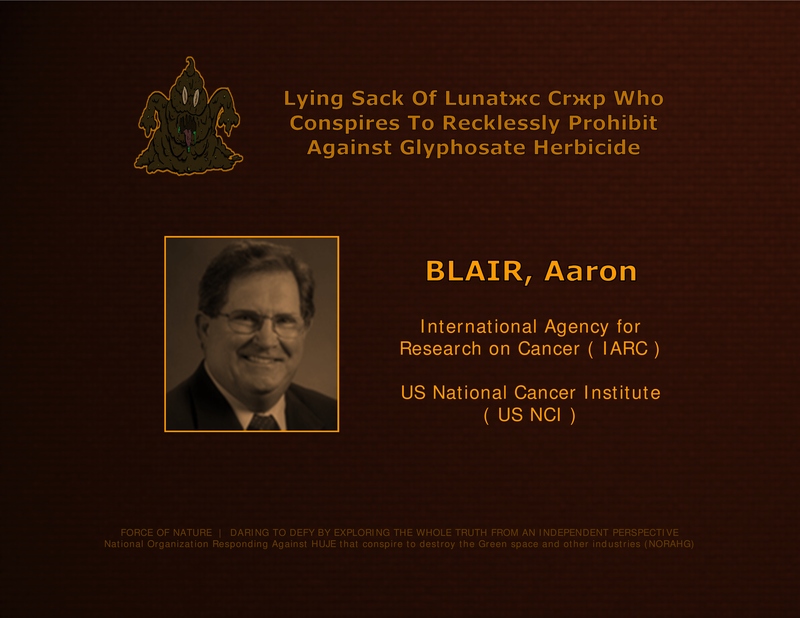 Aason Blair is the lunatжc–head of the IARC’s Glyphosate Working Group at the International Agency for Research on Cancer ( IARC ). Lunatжc Blair said that unpublished research by the US National Cancer Institute that he participated in would have made it less likely that Glyphosate would meet the agency’s criteria for being classed as « probably carcinogenic ». … THERE WAS TOO MUCH TO FIT INTO ONE SCIENTIFIC PAPER. AARON BLAIR IS A LYING SACK OF CRЖP ! … The broader issue is that they seem eager to have reached the conclusion that they reached. In October 2017, Reuters reported that a draft of IARC’s BOGUS HAZARD REPORT DIFFERED SUBSTANTIALLY from its final, published review. Reuters found 10 CHANGES made to the animal studies chapter. In each case, a negative conclusion about Glyphosate was either DELETED OR REPLACED with a neutral or positive one. Reuters was NOT able to determine who made the changes. IARC’s [ FAKE-NEWS ] CONTROVERSY over Glyphosate, the world’s most popular herbicide, began in March 2015, when it issued a statement ( also published in medical journal the Lancet ) that RE-CLASSIFIED Glyphosate as « probably carcinogenic to humans ». IARC classified Glyphosate as « probably carcinogenic to humans » ( Group 2A ). This was based on « limited » evidence of cancer in humans ( from real-world exposures that actually occurred ) and « sufficient » evidence of cancer in experimental animals ( from studies of « pure » Glyphosate ). IARC also concluded that there was « strong » evidence for geno-toxicity, both for « pure » Glyphosate and for Glyphosate formulations. It was a surprise finding to some in the scientific community because WORLD-WIDE, EVERY MAJOR REGULATORY AGENCY ( then and since ) has determined that Glyphosate, often paired with genetically-modified crops, is NOT CARCINOGENIC. In fact, its « lethal dosage » measure ( LD50 ) is about that of COMMON TABLE SALT. IARC’s determination was widely reported in the media and activists have used it to PUSH FOR BANS and « carcinogen » labels, succeeding in several countries and states. The state of California added Glyphosate to its « Proposition 65 » list of carcinogens, requiring products containing Glyphosate to be LABELED as a carcinogen. CALIFORNIA IS A LYING SACK OF CRЖP ! BITTMAN IS A LYING SACK OF CRЖP ! The main-stream world-wide science community has PUSHED BACK. All foods are chemicals and many CAN BE TOXIC at certain levels. But every chemical has a dosage curve showing how much ingestion is needed to cause harm, and most foods contain very low doses of these toxins. The IARC’s BOGUS HAZARD REPORT was more nuanced than many media reports, or even IARC’s summary statement, suggest. There was NO finding of a link between Glyphosate traces of food and cancer. The group found « limited evidence » of carcinogenicity in agricultural workers exposed to Glyphosate for non-Hodgkin’s lymphoma and prostate cancer. The IARC’s Glyphosate Panel found « sufficient evidence » of carcinogenicity in experimental animals. The panel DID NOT determine a specific cancer-causing mechanism or what level of exposure to Glyphosate may be harmful. … It means you ought to be a little concerned about. This ambiguity explains why IARC found cancer hazards, while the World Health Organization [ WHO ] itself declared that the IARC’s hazard report DID NOT INDICATE A NEED FOR MORE REGULATION of Glyphosate. Since the release of IARC’s BOGUS HAZARD REPORT, ALL prominent national regulatory agencies have reviewed the science and concluded that Glyphosate is NOT A CARCINOGEN. … Glyphosate is UNLIKELY TO POSE A CARCINOGENIC RISK to humans from exposure through the diet. … there is NOT STRONG SUPPORT for the « suggestive evidence of carcinogenic potential » cancer classification descriptor based on the weight-of-evidence, which includes the fact that even small, non-statistically significant changes observed in animal carcinogenicity and epidemiological studies were CONTRADICTED by studies of equal or higher quality. The strongest support is for « NOT LIKELY TO BE CARCINOGENIC TO HUMANS » at the doses relevant to human health risk assessment for Glyphosate. … NEITHER the epidemiological data ( i.e. on humans ) nor the evidence from animal studies DEMONSTRATED CAUSALITY between exposure to Glyphosate and the development of cancer in humans. … based on current scientific knowledge, NO CARCINOGENIC RISK to humans is to be expected from Glyphosate if it is used in the proper manner for the intended purpose. In the figure, each point represents the relative risk of developing cancer between people who had been exposed to Glyphosate and those who hadn’t. To interpret the figure, any points on the left side of the blue line ( less than 1 ) means that, on average, people who were exposed to Glyphosate were less likely to get that type of cancer. So what does this all mean ?!?! I may change my mind when the IARC’s full monograph is published later, but based on the data I could find, I DON’T SEE ANY EVIDENCE FOR ALARM. And I say that as someone who is exposed to more Glyphosate than a vast majority of the population. THERE IS NOTHING HERE THAT I THINK CAN TARNISH GLYPHOSATE’S REPUTATION AS A VERY SAFE PESTICIDE. One of the basic principles of toxicology is that « the dose makes the poison ». LOTS OF THINGS CAN CAUSE CANCER, BUT NOT EVERYTHING THAT CAN CAUSE CANCER DOES, BECAUSE PEOPLE ARE NOT EXPOSED TO THE LEVELS NECESSARY TO CAUSE CANCER IN THE REAL WORLD. It is the equivalent of saying a rock could kill you but NOT pointing out that it probably needs to be dropped on your head from a great height first. In October 2016, Reuters journalist Kate Kelland reported that IARC advised academic experts on its Glyphosate Working Group NOT TO DISCLOSE DOCUMENTS they were asked to release under U.S. Freedom of Information laws ― purportedly in an attempt to keep private the Glyphosate Working Group’s deliberations. In October 2017, the Times ( UK ) reported that lunatжc-scientist-activist Christopher Portier, a scientist who advised IARC’s Glyphosate Working Group, RECEIVED 160,000 DOLLARS from law firms bringing claims by cancer victims against Glyphosate manufacturers. Lunatжc Portier DID NOT DECLARE THE CONFLICTS-OF-INTEREST in a letter to the European Commission urging it to accept the IARC classification against Glyphosate. IARC was created May 20th, 1965, by resolution of the World Health Assembly. At its founding, members of IARC Governing Council were ― the Federal Republic of Germany, France, Italy, the United Kingdom, and the United States. Today, IARC’s membership includes 25 countries. The first IARC Director was John Higginson ( 1966 – 1981 ), who was followed by Lorenzo Tomatis ( 1982 – 1993 ), Paul Kleihues ( 1994 – 2003 ), Peter Boyle ( 2004 – 2008 ), and lunatжc-activist Christopher Wild ( 2009 – present ). Major world-wide funding sources include the European Commission, the US National Institutes of Health ( NIH ), the World Cancer Research Fund International, and the Bill and Melinda Gates Foundation. In September 2016, Republican Congressman Jason Chaffetz, Chairman of the US House of Representatives’ oversight and government reform committee, sent a letter to Francis Collins, Director of the National Institutes of Heath, asking why NIH continued to fund IARC despite having a record of « CONTROVERSY, RETRACTIONS, AND INCONSISTENCIES ». According to Congressman J Chaffetz, NIH has given IARC several millions of dollars in grants since 1992, including over 1.2 million dollars in 2016. In a 2015 article in the Atlantic, science journalist Ed Yong questioned the IARC’s « confusing » classification scheme. What we have is a CLASSIC IVORY-TOWER MENTALITY ― a group of academics who hole up in a room, make proclamations to the world, and ignore the chaos that consistently ensues. Perhaps we need a separate classification scheme for scientific organizations that are confuso-genic to humans. In December 2016, a group of 10 well-known academic, government, and industry scientists criticized IARC for using « OUTMODED HAZARD-BASED ASSESSMENTS ». In a commentary published in the journal Regulatory Toxicology and Pharmacology, the scientists argue that using only two categories, carcinogens and non-carcinogens, « SERVE NEITHER SCIENCE NOR SOCIETY ». Instead, they suggest approaches based on hazard and risk characterization, which allow for more informed risk management decisions. … For human epidemiological studies there are 7 cohort and 14 case control studies, NONE OF WHICH SUPPORT CARCENOGENICITY. The authors have included non-Hodgkin’s lymphoma ( NHL ), but that diagnosis is NO LONGER USED IN PATHOLOGY because it’s far too IMPRECISE. Even if you do include NHL, there are still 7 studies, only one of which is positive ― and that one is NOT A GOOD STUDY, in my view. THE WEIGHT OF EVIDENCE IS AGAINST CARCINOGENICITY … this appears to be a rather SELECTIVE REVIEW. IARC’s probable carcinogen designation sounds scary and IARC evaluations are usually very good, but to me the EVIDENCE CITED HERE APPEARS A BIT THIN. From a personal perspective, I am a vegetarian so I eat a lot of vegetables and I’m NOT worried by this report. • IARC had CHERRY-PICKED the studies to include in their evaluation. • The studies were of a VERY LOW QUALITY ( mostly NOT fit for peer review ). • A study has just been published where ten toxicologists show how IARC’s hazard assessment is OUTMODED AND INADEQUATE. • Monograph lead author, lunatжc Kate Guyton, had announced at an anti-chemical NGO meeting the year before that they would find certain pesticides carcinogenic. 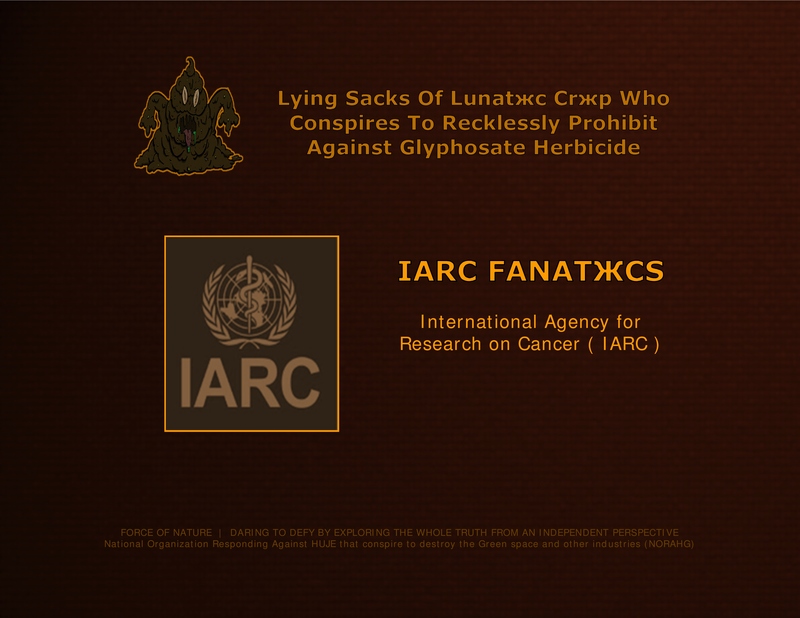 • IARC’s lunatжc Kate Guyton tried to SUPPRESS the Glyphosate Panel members from co-operating with freedom-of-information requests. 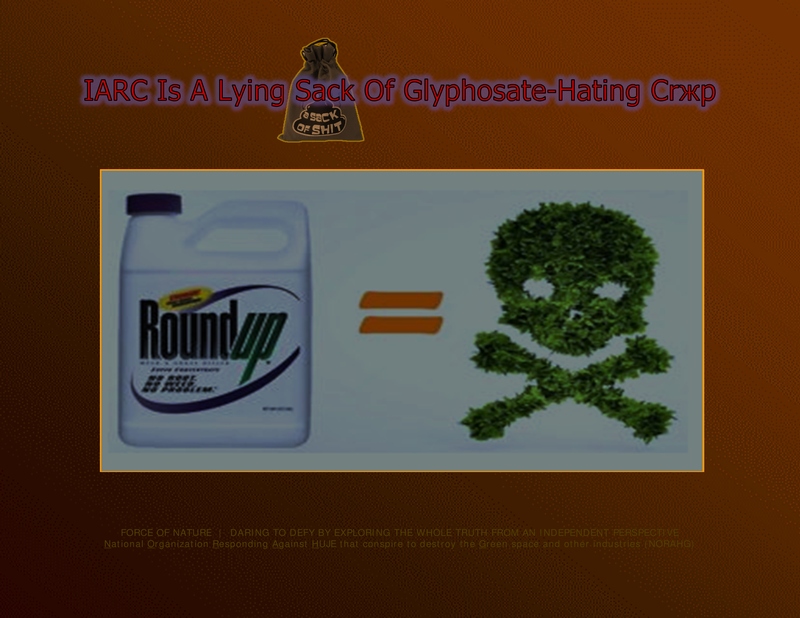 • Environmental Defense Fund lunatжc-activist, Christopher Portier, chaired IARC’s independent advisory group that recommended doing a monograph on Glyphosate. 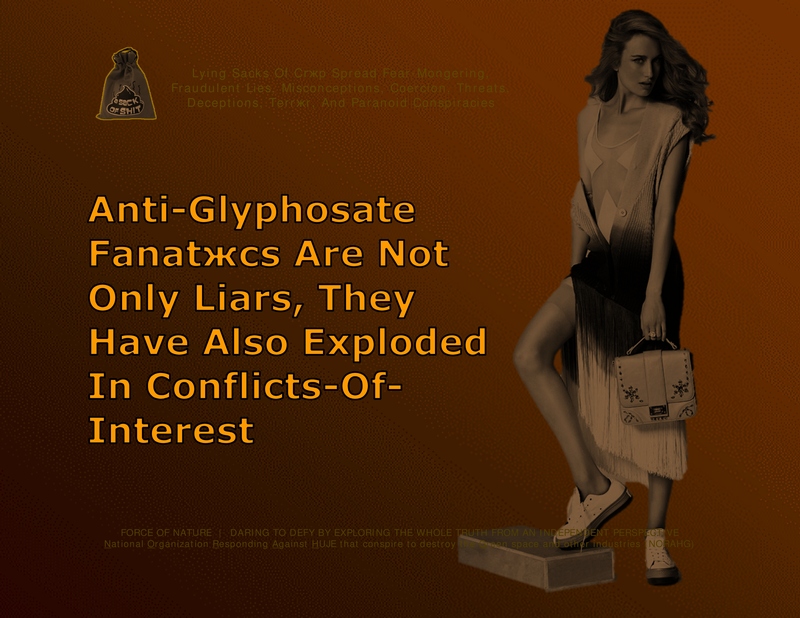 • Lunatжc Portier sat as the only external technical advisor to the Glyphosate Working Group. • IARC DID NOT declare lunatжc Portier’s AFFILIATIONS with Environmental Defense Fund, even though they knew about these clear CONFLICTS-OF-INTEREST at least six months earlier. 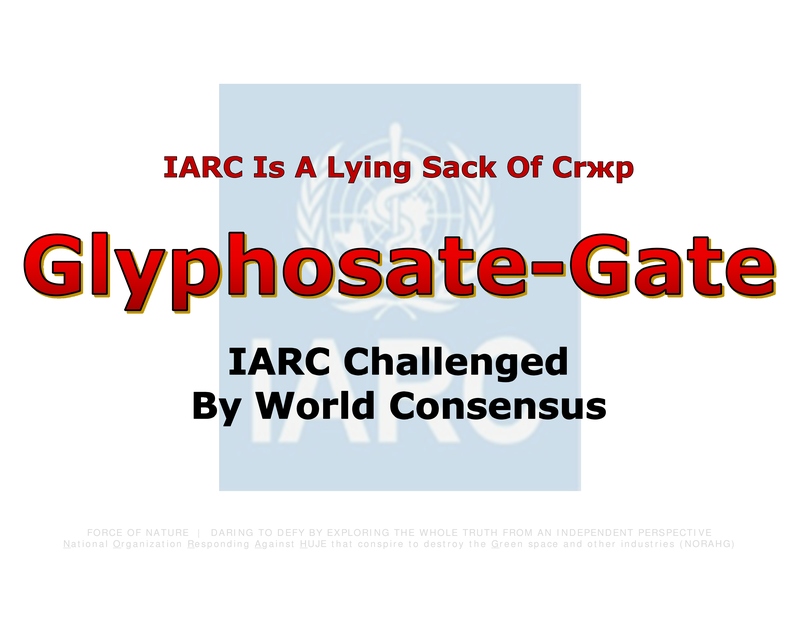 • IARC DID NOT distance itself from lunatжc Portier’s POLITICAL LOBBYING using his affiliation with the Glyphosate Working Group. • IARC’s lunatжc director, Christopher Wild, INTERFERED with a US Congressional committee’s internal investigation. • IARC’s Glyphosate Panel were found to be MEDDLING with US EPA research on Glyphosate. • IARC’s communication team displayed a series of UNETHICAL DIRTY TRICKS. • Rather, IARC went on the OFFENSIVE, ATTACKING SCIENTISTS and agencies who disagreed with their findings, including EFSA and the German BfR. • IARC’s communications team went so far as to provide information to an activist writer in Le Monde to ATTACK EFSA. • IARC DIMINISHED INDUSTRY STUDIES and rejected any involvement, advice or data of industry experts. • Their ANTI-INDUSTRY BIAS is outrageous. At IARC’s 50th anniversary, which had over 1000 cancer researchers and administrators in attendance, NOT a single industry cancer researcher from the pharmaceutical industry was invited. In January 2017, the American Chemistry Council ( ACC ), the trade group for US chemical companies, accused IARC of « DUBIOUS AND MISLEADING » work and called for IARC to be REFORMED.